If you use the Applications feature, there are two ways to contact your applicants that apply on Accountingfly. On the candidate’s profile card there is an envelope button. When you click this button, it will open the default mail application set by your operating system. For example, if you use Outlook it will automatically open Outlook. In addition, this method will auto-fill the Subject and Body of the email with some boilerplate copy to remind you who you are messaging and for what job. If you use a browser-based email service such as Gmail, you will need to copy and paste the email address from the candidate’s profile. 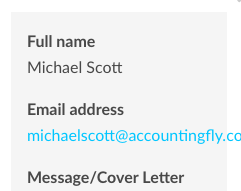 The email address will now be visible on the right side of the now-expanded profile card. You can right-click to copy the email address from here and paste it into your desired email application.